Built as part of the gated Plantation development on Four Mile Beach, this free standing, single level home shares the same high standard of workmanship and the same beachfront location in Port Douglas. Entry is via Andrews Close off Langley Road, through a security entrance to a double, remote controlled garage. The house is set within a private walled garden with grassed area, outdoor dining, a barbeque and it's own fully fenced and heated swimming pool, perfectly positioned to capture the winter sun. Inside, the interior features cool tiled floors, an open plan design with plantation shutters that can divide the living and dining area from the kitchen and bi-fold glass doors that open up the house to the garden. The luxurious master suite has an en suite bathroom featuring a large spa bath. The remaining three bedrooms share a bathroom. Fully self contained the property has split air-conditioning throughout with ceiling fans and is ideal for a large family or couples with small children. Facilities include TV with DVD in the living room and TV in the master bedroom. The house has a WiFi internet connection. Spacious and spotless with everything you could need! Hi Stacey We are pleased you enjoyed Plantation House and thank you for the lovely review. Hope we can welcome you back again, next time you are travelling our way. The team at Port Douglas Getaways. Plantation House was perfect for our family holiday. 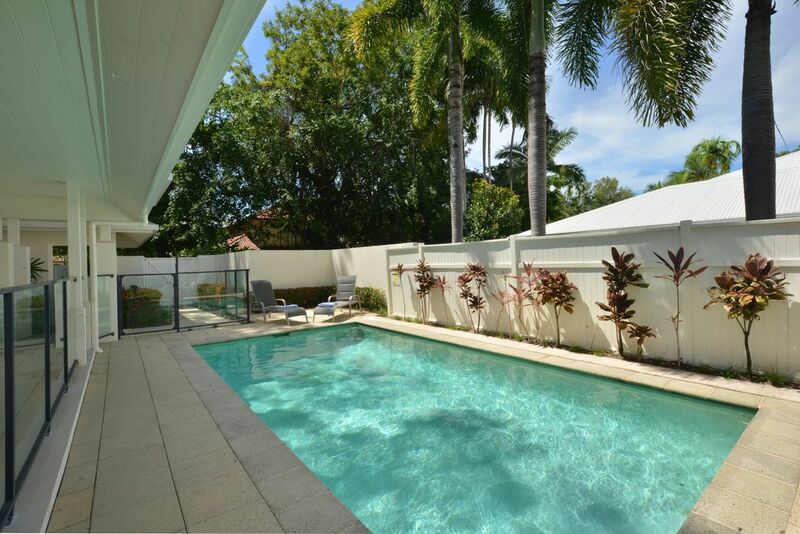 It is extremely well equipped, clean and bright with a good sized heated pool which we used everyday. The property is also in an excellent location being a short walk from a little park with playground for children and with easy access to Four Mile Beach. It is a little way out of town but this is no problem if you have a hire car. Thank you for your GREAT review. We are pleased you enjoyed your stay at Plantation house and appreciate you leaving the house clean and tidy on departure - We would certainly love to welcome you back again!